The essential elegance of the friendly apartments and the rich vegetation of the garden, with attention to every detail, could by just justify the name. But to make the Garden Villa on the sea something truly extraordinary are its privileged position on the Macauda Riviera and the fifteen steps that separate it from the Mediterranean Sea. That's right: the flowers and plants of Villa Garden on the sea end where the beach of Macauda begins. Only a small gate surrounded by two white columns separate it by a clear sea that is impossible to resist at all times of the day. At dawn the pink light of the sun that rises on the sea will peep out the window of your room and the red of the sunset will accompany the end of your days when, comfortably lying on the bed, you can hear the waves breaking on the shoreline and the vibrations of the palm trees, the only noises you'll have to get used to during your stay at the garden garden by the sea. The villa consists of two camera heads "House palm and queen". Casa la palma: The furniture of the apartment you live in, is truly unique: beds, wardrobes and all that you could have been made entirely of masonry. A choice that really makes this quaint place. The kitchen (with everything you need for cooking), the large living room with a dining area and a living room always made of masonry around a fireplace, above the two bathrooms and three bedrooms that offer six comfortable beds, with the possibility to add a bed in the room with twin beds and two more in the living room, bringing to a maximum of nine beds. television in the corner there is a DVD player, a console for Xbox 360 video games and a stereo radio-portable cd. The walls of the villa, all white both outside and inside, are insulated with polystyrene and guaranteeing a pleasant temperature even in the hottest days. Queen's house is the house where the owners live, who are always available to satisfy any request and give an exclusive service to guests of Casa la Palma. The airy patio gives the opportunity to eat outdoors both day and evening and every corner of the garden, created and cared for with passion by Carmelo, hides something to discover: ancient amphorae, Greek masks, brightly colored flowers and palm trees stem so big that I can not hug them. The garden is crossed by paths paved with pebbles that make delicious and colorful patterns that lead to the reserved parking (covered) and a cozy corner for those who want to sunbathe on comfortable loungers, chairs, table and a bar with mini-fridge or take a cool shower after swimming in the sea. 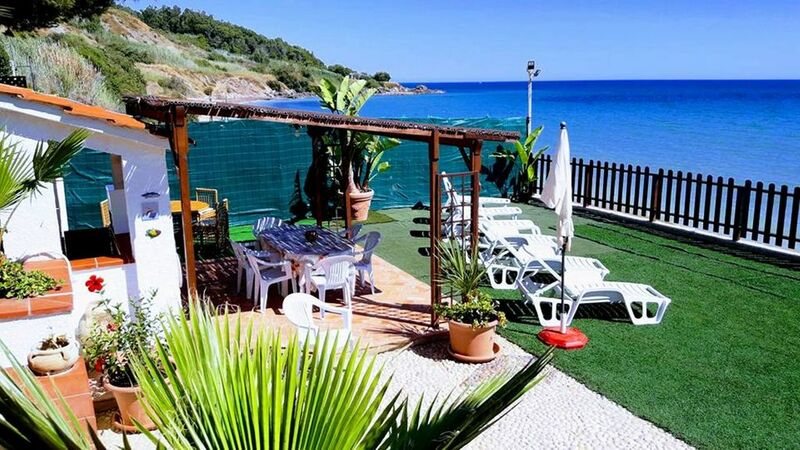 Because it is from this natural solarium, protected by tall palm trees, which leads to the beach: only fifteen steps to reach the clear waters of the Mediterranean. A sand and pebble beach with shallow water that gets deep in a gentle and gradual manner, a true "paradise" for adults and children. A few tens of meters, from both sides, there are two equipped beaches. Your arrival at the Villa garden by the sea will be carefully prepared by the owners who occupy the adjoining apartment and who will be able to help you during your holiday. Filippo will advise you on the tourist itineraries and will let you discover the secrets of Sciacca. Villa garden on the sea is located on the southern coast of Sicily 15 minutes from the port city of Sciacca. Near the villa you can do various activities, thanks also to the strategic location a few kilometers from areas and structures of great interest. - Tennis, Gym, swimming pool, kitesurf, windsurf, underwater activities, fishing, horse riding. I and my family live in Sciacca, it is the closest town to the Villa Eden on the sea; Is a fishing harbor known for its beautiful views over the Mediterranean and the medieval city center full of well-known churches, castles and squares. In the Greek and Roman times it was known for thermal springs, but developed more in the IX and X century by exporting the grain grown on the island in Africa. If you have never witnessed one of the legendary events in Italy, come to Sciacca's Carnival the week before Lent, when paper giant giants invade the streets, carried on allegorical wagons, and dazzling dancers entertain the crowd . I could never leave my beautiful town with its slow rhythms, sunsets to frame and genuine food. I decided to rent this property because I want to share with other people the beautiful beauty and lifestyle that I live in my beautiful villa. The special features of my home is that it is right on the sea, you can sunbathe in the area equipped with chairs, table, sundecks and a mini-bar with mini fridge and then dive into the Mediterranean Sea by going down only 15 steps ; Dining by watching the sea and the vegetation of the garden and relaxing listening to the waves breaking. Both of the bathrooms are equipped with shower, toilet, bidet, sink, cabinet and hairdryer. air conditioning 0.45 euro per kw. Bed linen, pillow covers and cover are provided. The entrance to the parking inside the property is with automatic gate, on arrival the owner will give the remote control. Inside the villa will find the password for wi-fi internet. They will be provided 3 towels (small, medium and large). The living room is divided into two zones, the first consists of a table and chairs (where you can add extra beds), and the other with two built-in sofas and a TV, DVD player, xbox360. two types of moka coffee makers, small and large. outside of the house can find the following spices: rosemary, sage, bay leaves, pepper, mint and basil. In addition to the indoor dining room, we have two areas from external dining room, adjacent to the kitchen with a capacity from 8 to 10 seats and the other in the patio sea area from 8 to 10 seats. The stereo system is a small radio player - cd with usb input, handy and portable in all areas of the villa. Some films will be provided. X box 360 with video games. In the garden lies something to discover: ancient amphorae, Greek masks, vibrant flowers and palm trees, in addition, it is crossed by paved cobblestone trails. The Private Tennis court is in the Verdura Golf & Spa Resort, is available only on reservations. The Private Golf Course is in the Verdura Golf & Spa Resort, is available only on reservations. From March to June, temperatures range from 15 to 26 degrees and offer the best conditions for exploring the natural beauty and the legendary historical sites in the area. July and August are bathed in sunshine with average temperatures hovering around 28 and 30 degrees. The area surrounding the Villa Giardino sul mare offers a fascinating glimpse into the life and cultural richness of Sicily. A few kilometers drive from the Villa is the picturesque port town of Sciacca. Explore the medieval streets and baroque churches of the town, have lunch in a restaurant with seafood specialties and relax on one of the countless sandy beaches of Sciacca are just some of the wonders not to be missed. Every February Sciacca calls attention to the actual Carnival, during which intrigued tourists are attracted to a dazzling parade of bright costumes and giant papier-mâché allegorical figures. Further south along the coast lies the ancient city of Agrigento, founded in 582 a. BC by Greek colonists. From here you can admire the unforgettable Valley of the Temples - UNESCO World Heritage Site - which contains the remains of eight Greek temples. Every year in July lighted columns of the temples group surround the Blues & Wine Soul Festival. Another site as old as fascinating is the archaeological park of Selinunte. The simple pleasures offered by the area around the Villa Giardino sul mare are certainly an alternative to consider: a walk on the beach or an adventure in the countryside and in the surrounding areas to collect the famous and aromatic wild fennel or seasonal vegetables such as wild asparagus. Do not forget the private access to the sea. The owner of the villa will be pleased to provide more details on the footpaths and itineraries accessible on automotive neighborhood. Near the villa I can perform various activities, thanks to its strategic location a few kilometers from areas of great interest structures. - Tennis, Gym, swimming, kite surfing, windsurfing, diving, fishing, horse riding.